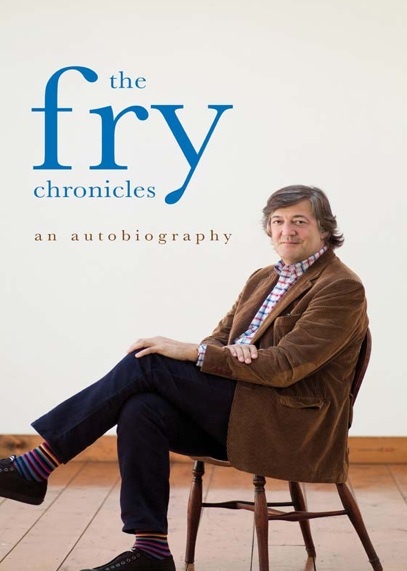 One always looks for a lighter read on holidays, so whilst we were away visiting family in the UK, I read the second installment of Stephen Fry’s autobiography, which covers his life from university through to him establishing his early career in comedy and on TV. And it rattles along as you’d expect; the use of language is sublime and Fry can certainly tell a wicked anecdote. Add to all this show-biz luvvie-ness a good dollop of self-doubt and some self-esteem issues, and we start to get some measure of Fry – he presents himself honestly, although at times his hand wringing does get a little much. Still, it’s a fun read and hard to put down – just the ticket for some light holiday reading. I read this book on a kindle, my first experience of using a dedicated e-reader. And I have to say it was marvelous; I am a convert. Much easier than a ‘real’ book, and the screen really is easy on the eye in the way reading books on my phone or a tablet is not. However, I do have a gripe; does no-one proof-read digital editions? I was reading the official version downloaded from Amazon onto their own reader, and yet scattered through the text are issues with ‘funny’ characters – unusual punctuation or superscript characters rendered instead as gobbledegook. Surely publishers should take more care with their digital editions, and do more than just download the text into an e-book format and hope for the best? I haven’t been around much recently, as we’ve been in the UK visiting family. All a bit of a whirlwind, but I did manage to do one thing I had planned – to go for a bike ride. I borrowed my father-in-law’s bike to go for a spin through the Warwickshire countryside. 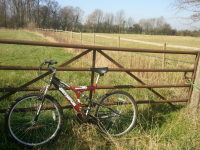 It was nice to get out, and riding through the lanes in the unseasonably warm March sunshine brought back memories of my youth, spent exploring miles of similar rural roads where I grew up on my trusty Peugeot ten-speed. In those days I used to ride all day on an unpadded saddle and thin plastic bar tape, with no knicks, gloves, jerseys, sunglasses, energy bars or flashing lights. I was made of sterner stuff back then, apparently. I note that the brand of my father-in-law’s bike – ‘Apollo’ – is the one sold by one of the UK’s largest bike retailers, Halfords. Halfords is not a specialist bike store; they are also an auto parts outlet. However, the Halfords branch I visited had a good 40% of the retail space given over to bikes and bicycle accessories, and had a bike service centre. The other brand they stock is the ‘Boardman’ range; generally well regarded mid-range bicycles endorsed by Chris Boardman. It’s a pity they stock so many BSOs, though – surely they could stock the cheaper ranges of the reputable brands instead? I’m sure that my mother-in-law thought she was buying a reasonable bike from a reputable supplier when she went to her local store to buy a ‘men’s bike’ as a present for her husband. Clearly she was neither sold a good product, nor given good advice about a suitable style of bike. Oh well, I suppose it’s all down to profit margins. I further observed the bicycle riders in the UK divide into two predominant types. The first is the enthusiast, mostly seen riding around the rural lanes. These further divide into two types; younger ones on lightweight racing bikes with lycra and helmets, and older ones on touring bikes with mudguards and beards, usually helmet-less. Indeed I saw several groups of riders all out together, some in helmets, others not. Which is just how it should be; people free to choose their headwear as suits them – and of no more significance than choosing whether to not to wear gloves. The second group were seen in the urban areas, usually riding cheap mountain bikes rather similar to the one I borrowed, wearing everyday clothes, and invariably without helmets. Utility cyclists, in other words, getting from A to B across town on their bikes. There were quite a lot of these riders; many more than I remember from my last visit several years ago. Clearly the cycling boom is happening in the UK too. The other noteworthy thing about these urban bike riders is that they were all, pretty much without exception, riding on the pavement. The UK suffers from the same lack of cycling facilities as we do in Australia, and clearly people were voting with their wheels and riding where they felt safe, away from the motor traffic – despite riding on the pavement attracting a fine. 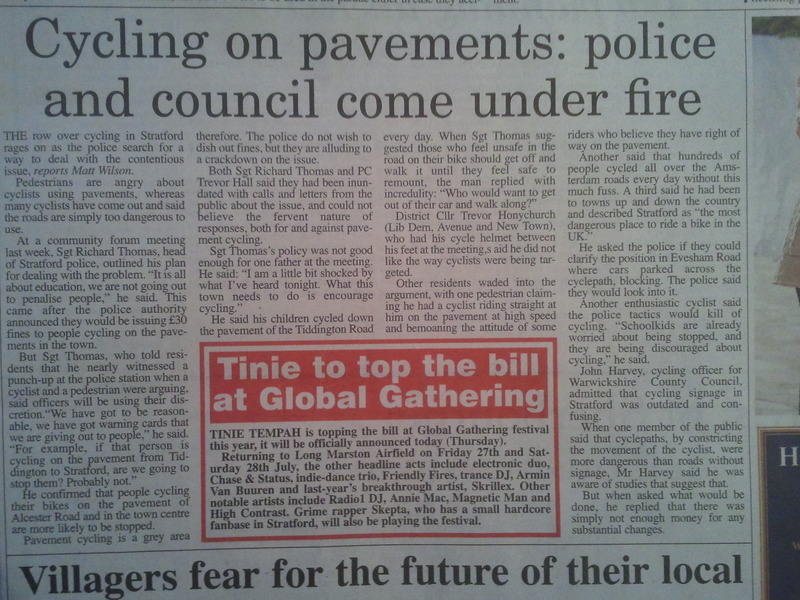 The rise of the pavement cyclist is not going unnoticed, as this article from the local paper shows. And, like here in Australia, somehow the debate seems to turn into an ‘us vs them’ argument, rather than focussing on the real issue – the lack of cycling facilities, and the relentless focus on building roads for the exclusive use of motor traffic, to the exclusion of all other road users (pedestrians included).